As much as 30% 0f household waste can be composted and should not be sent into a landfill -composting is the answer - and using the Kitchen Compost Collector is a most practical way to collect all your organic waste. The ECO Kitchen Compost Collector includes a Carbon Filter which reduces any organic smells significantly. It is recommended to replace the filter every 3 months. Replacement filter 3 packs are available, see wholesale price list for details. Unit is designed to hand from screws or hooks inside a kitchen cabinet or under sink. Also works great sitting direcly on counter. It is recommended to replace the filter every three months. I have lost my filter holder, can I purchase a new one? Yes, please contact customer service at 877-760-8500, ext. 701 to order a replacement. Can I order parts for my ECO 2000? Yes, as the distributor, Exaco has replacement parts available. Please call customer service at 877-760-8500, ext. 701 to order. There were 2 little green plastic (“house” shaped) pieces in the package with my ECO2000. What are these? These pieces usually come inserted underneath where the handle attaches to the bucket. These are packing material used to keep the buckets separated when they are nested for shipping. Some people have found they are handy to hold a compostable bag in place. What can I do to keep down gnats or fruit flies? 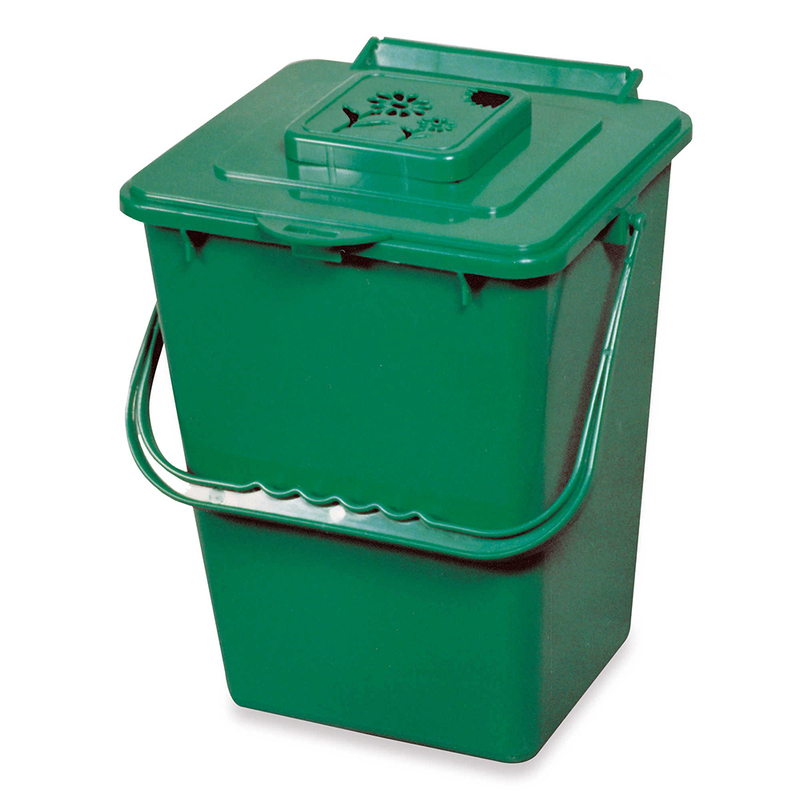 As with any compost collector, it is recommended to empty the contents into an outdoor composter every 2 or 3 days. It is helpful to then rinse out your Eco 2000 or run it through the dishwasher before the next use. Can I use a bag with the Eco2000? Yes! There are compostable bags, such as our Biobags in the 2.7 gallon size that work perfectly with the Eco2000. They are BPI-certified compostable for city compost collection as well! Can I use the Eco2000 as an indoor composter? No, the Eco2000 is solely meant to be a kitchen scrap collector to be emptied into an outdoor composter or city collection. For proper composting you need a large (outdoor) pile with a mix of greens (kitchen scraps) and browns (such as garden leaves). If you are wanting an indoor composting option that will work with only kitchen scraps, please consider our Urban or City Composter, which utilizes a Bokashi-style fermentation system to create compost. Can the Eco2000 be used inside a cupboard? Yes! The Eco2000 has 2 notches on the back just underneath the cover that allow it to be hung from hooks or other hardware (not included) from a wall or inside a cabinet. I have a strange smell coming from my Eco2000, what can I do? We recommend emptying your Eco2000 into your compost pile every 2-3 days. The filter should be changed every 3 months. If an odor persists, you may run your Eco2000 through the dishwasher. It can also be helpful to add a bit of baking soda to the mix to help with odors. Unit is designed to hand from screws or hooks inside a kitchen cabinet or under sink. Also works great sitting direcly on counter. Warranty 2 years against manufacturers defect. Pallette Size: 40" x 48"
Size of Drop Ship Box: 9" x 9" x 11"
My son bought this for me as a gift. we are a family of 6 and this size is a perfect match for our daily needs. The contents slide out smoothly, it's a breeze to wash, there is no residue smell and the best part, no more fruit flies!!! Hello I’m looking to see if you sell racks for the Eco 2000 so that I can keep the unit under the counter attached to the counter door. There seems to be a spot for it between the hinges on the back top of the composter. Thanks for getting back to me. I guess I can make one myself but i haven’t yet. The Eco2000 has the notches included so the bucket can be mounted to a wall or a kitchen cabinet. We don’t include the hardware for this bucket as it may vary for the place you are mounting the ECO 2000. There is no additional bracket – the notches are designed to work well hanging from the heads of screws. I have a green kitchen compost bin and I lost the square cover that keeps the filter in place on top of the bin. Do you sell replacement parts? Yes, we have the replacement filter holders available for $3 plus $3 shipping USPS in the US. The filter holder comes preloaded with a filter. Please call me at (512) 407-8500 Ext 701 to place an order. Thank you for reaching out. You may wash the carbon filters – this can also help extend their life. There are also packs of replacement filters available if needed. My compost pail came with 2 green triangular (arrow shaped) hard plastic pieces. I can't figure out how or where they are to be used. Please let me know. Thank you. Those small pieces you can just throw away. They are only used to separate multiple units when nested together (from the factory). I need to order the clip on piece into which the carbon filter snaps and then attaches onto the collector bucket. Somehow it came loose and now has been lost. Please specify the part # and price. I will also be ordering four more of these collector buckets. Thank you. Is there a way to attach the Exaco Kitchen Compost Pail to the door of the cabinet below the sink? Are parts included for this purpose? Also I teach a public NJ high school foods lab that has 6 kitchens (of 4 students ea) operating every day. (About 140 kids/day) How do you define 'wholesale' and/or do you have an education discount? Thanks for your question. Yes, you can hang the ECO 2000 green Kitchen Compost Bucket with carbon filter on a door under the sink. But we do not supply the appropriate screws to do so – sorry. We offer volume discounts to people who wish to buy at least 10 units (1 master carton) - pricing depends on the volume. Please contact me directly at customerservice@exaco.com or gives us a call at 1.877.760.8500 and we will get you what you need if you are able to order the minimum amount of units. In March 2015 I purchased an Exaco ECO-2000 compost bucket. Within a month one of the pegs holding the cover on broke off. A couple of days ago the second peg broke off so now my lid is no longer attached to the bucket. Can I get a replacement lid? Hello. Thank you for visiting our website. I have this bucket in my preschool classroom. It is wonderful and the kids love using it. However, the lid broke where it connects to the bucket so that one side no longer connects. Is it possible to replace just the lid? Thanks! Can the filters for the ECO2000 Kitchen Compost Collector be ordered separately? If so, how? Hello, Yes you can get the filters separately. The part number for them is ECO2500 and they are available on several of the major websites. I have never used a compost collector. I received the eco-2000 kitchen one with extra compost bags as a gift. What do I do next? What a fun gift! You can use the Eco-2000 to carry your kitchen scraps to your main compost bin. I would start off with small kitchen scraps and go from there. There is also a good amount of information about composting in the internet. Hi, I have the Eco Kitchen compost and unfortunately we (ok, it was really my husband) lost the green lid where you put the filters. Do you sell just that piece? I hope so, because I really don’t want to replace the entire thing. Thanks! Thanks for visiting our site! Yes you can purchase parts for all of our products straight from us. Contact customerservice@exaco.com or gives us a call at 1.877.760.8500 and we will get you what you need. Hi, I have 2 of your ECO KITCHEN COMPOST COLLECTORs WITH CARBON FILTER. Both have lost the green plastic piece that holds the carbon filter (falls off when they get dumped out). Can I get replacement parts? Thanks! We have lots replacement parts available. Give us a call at 1-877-760-8500 or email customerservice@exaco.com or gives us a call at 1.877.760.8500 and we will get you what you need. When ours arrived a small green plastic piece was in the bottom of the pail. It looks like a little house with 2 legs on the bottom. The little green piece is used to separate them when they are shipped in bulk. You are safe to toss it in the recycle bin. Hello, The lid on my bin I just bought broke (hinge post), how do I get a replacement? Give us a call 1.877.760.8500 and we will get a new one to you.